Nate Groves submitted this photo and caption. This is a picture of Carolina Crown mellophone veterans Aaron Theall ('08), Nate Groves ('07-'09), Holly Maldonado ('07-'09), Lindsey Gray ('09), and Eric Vanderlaan ('06-'09) at the Southeastern Horn Workshop 2010. It was great to meet up in a setting outside of drum corps and talk about how our corps experiences have influenced our concert playing, and even our own teaching styles. 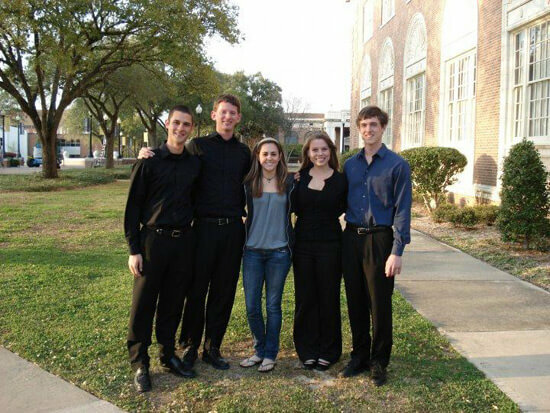 The event is a regional collegiate F horn workshop held annually, this year it was hosted at the University of Southern Mississippi in Hattiesburg during the weekend of March 27-28.